I am a bad little blogger. I’ve been cooking, but not writing. I mentioned in the last post that this is where I take out the red pen, and that’s what I’ve been doing. So back to it, shall we? Although simple, the creamed corn was my favorite thing so far. It was fresh and tasty. To me, it tasted like summer in the middle of winter, and that makes me very happy. It calls for firm tofu, which seems a little silly to me considering you are going to whisk it to make it soft. I asked CK about it and she said that is what she always has in the house. I also think that there was too much onion in it. Another thing to address: what is a “medium” onion anyway? I also thought it needed pepper. When I added some it was amazing. And, no, I did not cheat and use one of these. Hopefully the SOPA people will not come after me…. Oh wait. 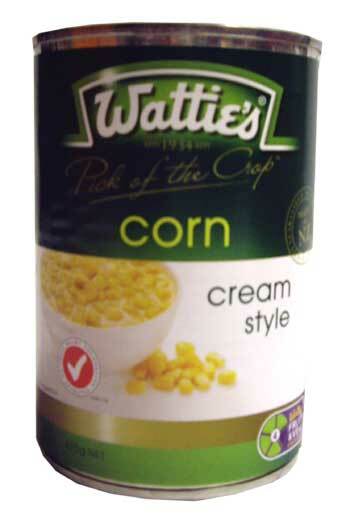 Wattie’s is British. The next time I cooked it was a marathon, because the deadline to have this thing DONE keeps on creeping. Thus far I have made a tamale pie, cabbage rolls with sun-dried tomato sauce, baked beets, various salads and greens, and a couple other experiments. I’ve become good friends with a banjo playing optimist that works with the co-op, and we’ve been trading ideas for this. Did you know that there is something called a Lion’s Head mushroom that tastes like lobster? I made a sushi roll with it, and I thought I was in Boston. Please do not cook yours with soy sauce like I did, it will taste like salty liver. Just keep it simple and use some unflavored oil to saute them first. Luckily, I know to split my batches for catastrophies like this. Go ahead, give it a go! Hey Amy…. When I click on your equivalencies link, I get a picture of soy sauce (not what I expected, for sure!). Nice work otherwise, thanks for the post! You younguns don’t know the meaning of ‘bad blogger’! Seriously – thanks for your cheerful contributions which warm the heart. Yes the soy sauce was a surprise, especially to laminate and stick on the wall? … very Andy Warhole! I’m looking forward to seeing CK’s cookbook – that it is half filled with recipes surprises me not one bit! Next post: Resources – Anne Dellenbaugh, MA, RTY-500, C. Ay. > Reconnect women with the living arts of food, clothing and dance. The Library is here to support those goals. We encourage women to submit relevant articles for consideration for inclusion in the Library’s collection. Suggestions for new areas will also be appreciated. Like all libraries, this one is dependent on its community. If you find articles of interest, are interested in writing articles, have birth stories or other information consistent with the Whole Woman philosophy, please forward them to submissions (at) wholewoman (dot) com.